Das voll ausgestattete 2-Zimmer-Wohnung befindet sich in einem stilvollen Sicherheitskomplex einen kurzen Spaziergang von Darlinghurst Dorf cafe Zone und Rushcutters Bay trendigen positioniert. In ruhiger und lichtdurchflutete Ambiente mit Viertel Paddington Blick Diese Wohnung verfügt über einen großen Wohn- und Essbereich und eine offene Küche mit Gassteinplatte Theke. Queen-Betten mit Einbauschränke in jedem Zimmer, 2 Bäder, Haupt mit Badewanne. Die Master-Zimmer hat ein eigenes Bad mit Juliette Balkon mit Blick auf des Komplexes wunderschön gepflegten Gärten. Genießen Sie große Wohnzimmer mit einem großen LCD-Fernseher, voll ausgestattete interne Wäscherei, Reverse-Zyklus Klimaanlage, Gasheizung und Doppel Auto Platz. Der Gebäudekomplex bietet einen Fitnessraum und Besucherparkplätze. In der Nähe von Geschäften, Supermärkten, öffentlichen Verkehrsmitteln und Restaurants innerhalb von Minuten von Sydney CBD. Die perfekte Wohnung für diejenigen, in komfortablen Luxus zu leben, während die große Atmosphäre von Sydney Eastern Suburbs genießen. Das voll ausgestattete Anwesen umfasst eine hochwertige Ausstattung und alle Annehmlichkeiten, um sicherzustellen, dass Sie einen komfortablen "home away from home 'genießen. Ein kostenloses Willkommenspaket beinhaltet Ihnen den Einstieg mit Tee, Kaffee, Zucker, Milch, Lollies, Shampoo, Conditioner, Seife, Toilettenpapier, Papierkorb Taschen, Geschirrschwamm, Wasch- und Geschirrspülmittel zu bekommen. Eine einmalige professionelle Abreise sauber Gebühr für den Aufenthalt, die Reinigung der Wohnung, luxuriöse Bettwäsche und Handtücher gehören. Serviced Reinigung ist auf Anfrage erhältlich. 10% Rabatt für Aufenthalte länger als 28 Tage, 5% Rabatt für Aufenthalte länger als 14 Tage. Mindestaufenthalt 7 Nächte aber wir erlauben manchmal einen Mindestaufenthalt von 5-6 Übernachtungen zwischen Buchungen, bei denen es weniger als 7 Nächte gibt. We were a group of two couples who stayed for 11 days in this unit and enjoyed it very much. It is centrally located in a nice neighborhood, it was secure and quiet, and fit our needs well. We could go out for several hours, return , and go out again since everything was nearby. Elise was very accommodating and when we had a problem with the wi-fi she came right away to take care of it. Since we weren't eating lunches or dinners there it didn't matter that there was very little in the way of kitchen basics. We liked that there were amenities in the bathrooms since we travelled lightly, and the washer and dryer with the soap provided was another big plus. We enjoyed our time there and would definitely recommend it. Very homely and great having two bathrooms. Only short walk to train station. Perfect apartment for our transition back into Sydney from overseas while waiting for our furniture to arrive and find a more permanent address. Very well appointed and comfortable in a great location allowing us to relax. High recommend this Inner City Sanctuary. Thank you again. 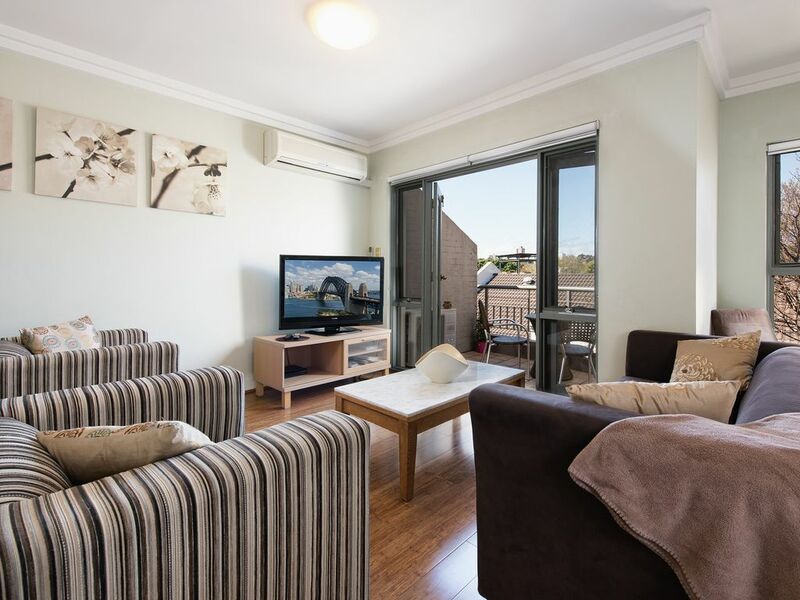 Fairly nice apartment, It's well located, around 800mtrs to Kingscross station, bus stop, Coles, and restaurants nearby. Well secured car park and well secured access to the apartment. In Kitchen Dishwasher was smelly, In bedding, it would have been great if there was some extra comforts for kids I ended up buying my own comfort. Otherwise everything was great, I surely will stay again in my next visit and will recommend it's fine for the price. Thank you for your feedback Senthil. I am sorry the dishwasher was smelly I am not sure what this was as I have never noticed this before, so I will have an inspection of this incase there is something wrong with it. Each guest is equipped with towels, pillows, sheets and blankets. I will look into what other comforts I can bring to the apartment to improve the overall experience. I am very pleased to hear that you would still like to stay again, you are very welcome!! Accommodation suited us just fine, central and easy walk to train. Apartment is well laid out and just what we were looking for - home away from home. Would definitely stay again if coming back to Sydney. Thank you for your feedback and glad you had an enjoyable stay. We look forward to having your guests and you stay again in the future.